Andy Garcia (Modigliani) stars and makes his directorial debut in a passionate and historical tribute to his native Cuba. Havana in 1958 is a place of pleasure for many, but others are not happy under the rule of dictator Fulgencio Batista. As the revolutionary forces of Fidel Castro and Ernesto “Che” Guevara prepare to move on the city, Fico Fellove (Garcia)—owner of the city’s classiest music nightclub, El Tropico—struggles to hold together his family and the love of a woman (Inés Sastre), not knowing that his club will become more than just a stage for popular entertainment. Observing all is The Writer (Bill Murray) an expatriate American who sees Fico being drawn into events as the revolution changes everything. Though Fico watches a culture vanish and a people transformed, it is his love of Cuban music that keeps his memories alive. Co-starring Dustin Hoffman and Steven Bauer. Written by Cuban novelist Guillermo Cabrera Infante. 'Lost City' a love song full of anguishPerhaps there had never been quite so many tears at the Gusman Center for the Performing Arts. 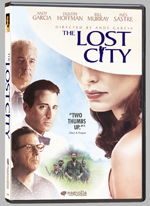 The Lost City, Andy Garcia's love song to his homeland -- luxurious, dreamy and 16 years in the making -- played the Miami International Film Festival on Sunday night to a sold-out crowd of mostly Cuban Americans who, decades into exile, won't forget the anguish of leaving land and loved ones behind for the sake of a new start.